So I'm aware it's pretty normal for a brand new baby mouse to not survive. I'm just checking to make sure there isn't anything I could be doing better for the remaining babies. It had a milk belly showing, so I know the mama is feeding them. I keep my AC at 70, is that too cold for babies? They're in a glass tank with fleece and tissue added to their normal corn cob and paper bedding, in a fleece nest mama stuffed tissues into. I shut the vent into that room just in case it was too chilly, but maybe I should've done so earlier. 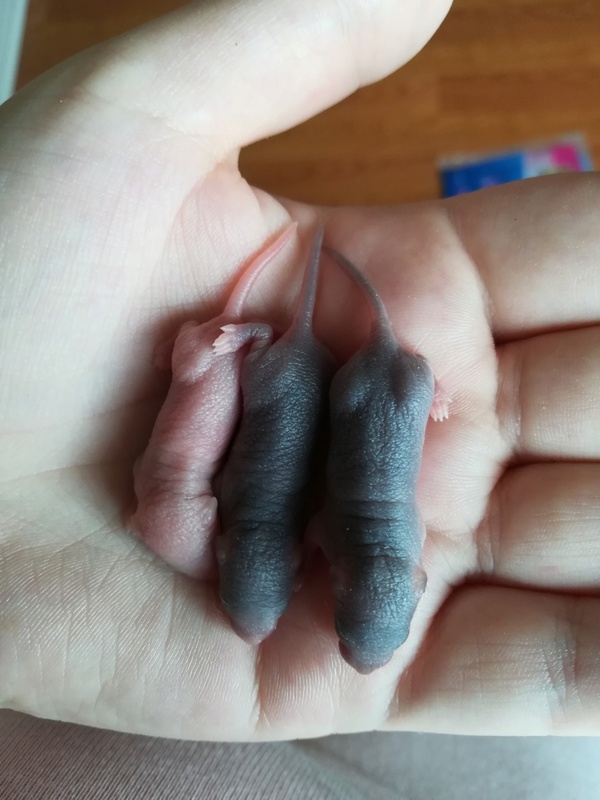 She's a first time mom, she didn't even notice it was dead, I had to remove it myself from the other babies. The babies, three including this one aren't/weren't moving a whole lot, and one is more active in its wiggling. Are they maybe just weak babies? There's only 4, well, now 3 but I don't think she was overwhelmed. There was not much squeaking last night, I think only one is vocalizing? She's gotten little servings of scrambled egg with lettuce and carrot along with her normal seed mix and rodent block. She's behaving like a very good mom, she's taking care of them as far as I can tell, she's eating her food, and sitting in the nest with them. One of the remaining 3 isn't growing fast enough. Is there a way to know if it's a runt or a "peanut"? I'm not seeing a prominent milk band today either. I'm going to try supplementing with kmr starting as soon as the pet store opens. It's still pulling through but I don't see a milk tummy right now. Clearly she's been fed in the last 24h or she wouldn't still be making it but I'm not convinced she's nursing long enough. She's the most active in moving her body and in making little sounds. Her nose/mouth area is a bit red. Their ears are all starting to peek out a tiny bit, it's very cute. The other two look like teeny tiny baby hippos with their dark wrinkly rolls! It didn't want to eat from the paintbrush. This morning it's disappeared from the nest and I can't find it anywhere in the cage. There's no mess, and the mom was fed a good chunk of protein yesterday, but I'm guessing she disposed of it somehow. It was very small still, so I was preparing for it to not become grown, but it bothers me a little that I can't find the remains. The other baby was buried under my cherry tree seedling and I was going to put them together.